To make your online shopping experience easier, we have now introduced our Click & Collect service. 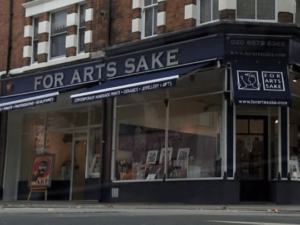 From the comfort of your home our Click & Collect service allows you to shop the For Arts Sake range online and collect it at either our Ealing or Hendon store; meaning you can pick up at a day, time and location that is convenient for you. Once you have received an email confirming that your order is ready for collection, simply visit the store to collect your parcel.